2013 was the 50th ! Anniversary of Formula Vee !! We are now in our 56th year in SCCA! Get a DVD of the 45th! US Formula Vee is based on the 1963 Volkswagen Beetle. The 1200 cc engine, 4 speed transmission, link pin front suspension, drum brakes and steel wheels are stock, modified stock or or equivalent parts. The chassis is a tube frame design and the body is generally fiberglass or aluminum. By 1966, FV was ranked third out of 17 SCCA classes, in terms of numbers of racers. Amazingly enough, even with there now being some 30+ classes, FV remains 3rd on the overall SCCA list - first in the Open Wheel category. The intention of this class was (and still is) that the average person could race and maintain the car with minimal expenditure, and it has proven itself successful for over 55 years. The class is not only about controlling cost but to enhance competition by controlling technological advances and emphasizing driver ability. Primarily a class in the Sports Car Club of America (SCCA) many other organizations have adopted variants of Formula Vee as a class. Over the years the rules have slowly evolved to lower cost, allow replacement of discontinued parts, or to relieve construction issues. In 2007, a 'Top National' FV ready to race would cost around $20,000. The same car could be bought as a kit (minus the Volkswagen parts but including the motor and transmission) for about $8,000, . Maintenance cost varies significantly and will be mostly related to tires and amortization of the motor rebuilds if you don't have crash damage. On the good side, a lot of crash damage can still be fixed using junk yard parts (and a lot of labor), but 'race ready' parts can be purchased from a number of entrepreneurs around the country if you want to skip some of the labor stuff. A top running Formula Vee will top out at about 120 mph (190 km/h) and corner at about 1.7 g. The 2019 minimum weight is 1025 pounds with driver. One of the most interesting aspects of the class is that, cars built for the class 30 years ago can still be competitive today - that says a lot about class and rules stability as well as cost containment. FV is one of the largest classes at the SCCA National Championship Runoffs and, in fact, had the largest car count in 2007. FV was also third in competition number ranking across all SCCA classes in '07, '08 and '09 and continues that reign today. Variants of the Formula Vee rules exist in the Canada, UK, Ireland, Australia, South Africa, Germany and New Zealand (and probably other places). Although conceived and implemented in the US in 1963, the world wide class of FV truly took off in 1966 when Formula Vee took hold in Europe. It proved very popular as a low-cost route into formula racing and quickly gravitated to other parts of the world. A few names you might recognize got their start in FV - Kent Prather, Arie Luyendyk (Dutch Series), Rick Mears, Bobby Rahal, Scott Dixon (New Zealand Series), Niki Lauda (European Series) and many, many more. Today's FV series is still strong and is generally one of the largest classes during any racing weekend. 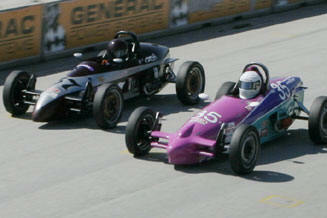 Charlie Hearn (37) and Dan Alford (82) lead the Vees at the start - Texas World Speedway in Feb, 2004. Steve Davis (80) pulled off the win by 1/2 car length at the finish over Charlie Hearn. You can see from the 2 pictures above, the wide variation in car body design, yet the equality of uniquely designed purpose built race cars is unparalleled. charging Bruce Livermore at the line. One of the current goals is to create and maintain a registry of all active Vee drivers in the United States - including all sanctioning bodies beyond SCCA. This website will attempt to be a central repository of information about the class. Please register if you are an active racer, involved in a team or interested in getting closer to the FV sport. Your data will be inserted into a database from which the FV community can draw valuable information about its participants. If you wish to protect your personal data, you may include a password that will preclude anyone else from editing your data by just knowing your last name and email. (if you lose your password, you'll have to contact me to get in again.) We hope you will sign up if you are interested and please pass this site on to your friends or anyone else who is interested in Formula Vee in the U.S.A. When did you first become involved in FV? Are you a currently ACTIVE FV participant? Driver? Crew? Any other comments you'd like to send. This information will be used to provide information to decision makers as well as contact registrants directly when warranted with regards to the future of the class as it progresses. We would very much like to have EVERY Formula Vee participant in the US sign up on this site. We will make every effort to directly notify everyone whenever there are SCCA rules issues to be addressed .. and any other time we feel it is appropriate. Rest assured that you will NOT be getting email from us for things that are not important to the class or keeping this database current. If you have changed your email address or need to EDIT previous data, please send the info to me and I'll update the record for you. These pages are always UNDER CONSTRUCTION and will be updated as time is available, so please check back often. Do YOU have a piece of information or a link that you think should be on these pages? Send it all to The Webmaster and we'll see if we can get it posted here somewhere.